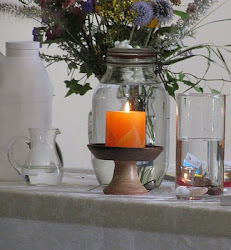 UU A Way Of Life: Love is not something you do; it is your state of being. Love is not something you do; it is your state of being. It seems paradoxical to become aware that we fear love. We are afraid of getting too close and getting hurt again. We are afraid of having our heart broken again and so we keep our distance or we become possessive and jealous and at times we even hate the ones or the things which we perceive as abandoning us or rejecting us or attacking us in some way. It is poetic to say, "Love hurts," but that is not true if we understand what Love is. It would be more precise to say, "Ego hurts." because what we call "love" is not real Love. Osho says, "Very few people in the world are loving, that's why there is so much misery. Everybody wants to be loving, everybody wants to be loved, but nobody learns the art of loving. It is a great art. You are born only with the potential, but potential has to be transformed into the actual. It has to be made into a reality and the first requirement is becoming more alert." Most people don't know what love is. It is easier to say what love is not. Love is not jealous. Love is not possessive and controlling. Love is not manipulative to get one's needs met. Love is not attachment and clinging to reduce one's insecurities and fears. Love is not caring for so one can feel superior. Love is unconditional and a sharing of one's well being and peace. Love is generous and forgiving and nurturing. Love desires the well being of the other as if the other were part of oneself. Love is kind, benevolent, and whole hearted. Love really has no definition because it is beyond definition. It's opposite is not hate but fear. Love is joining with the whole and as such love is a holy thing, a holy experience which brings peace, joy, and bliss. Further, love is not special and not exclusive. The art of being loving is a state of being not an attitude towards a special object. We don't do love. It is not a thought, or a feeling, or a behavior. 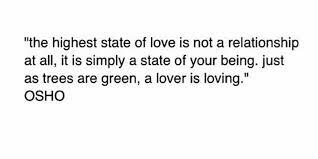 Love is a state of being. And as Stephen Gaskin said one time, the only thing, in the last analysis, we really have to offer another human being, is our own state of being. 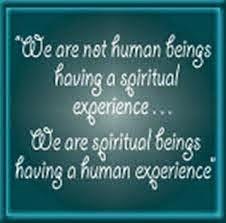 Osho teaches that in order to become a loving being and not asleep in the ego we have to be alert. As was written on the men's room wall over the urinal, "Be a lert. The world needs more lerts."